Justin and Melissa are the owners of Yolo Restaurant in East Amherst, NY. They had their wedding on October 10th, 2015. The ceremony was at St. Louis RC Church in downtown Buffalo. We did photos on Main St. in the Theater District in downtown Buffalo. Then their reception was at Salvatore's Italian Gardens. 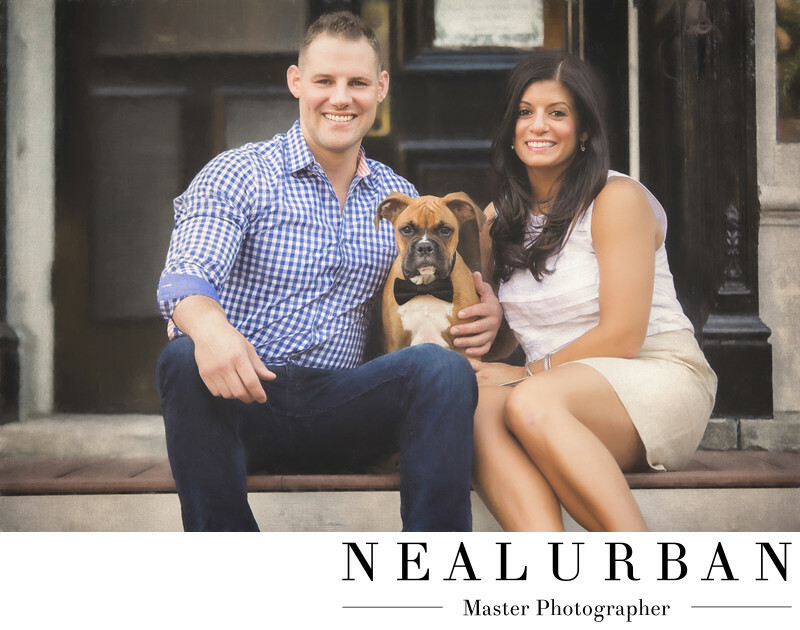 For their engagement session, they wanted to go to the Clarence Center area. One of their favorite restaurants called Gertie's is located there and they wanted some photos done outside. Then they mentioned they wanted to bring their dog for some photos! We love dogs and were so excited! Someone else walked to dog over and met us at the restaurant. We like to have someone else there to take care of the dogs, as we do not need them in all of the photos. We also do not want the couple to have to worry about the dog. And absolutely, no leaving the dog in the car to finish the session. This image is too cute. The dogs face is priceless. They actually just got the Boxer not too long before the shoot, so we got to work with a puppy! He has such a stern face. He did not seem too happy to have his photo taken, but he looked at the camera the entire time! We loved the little touch of the bowtie as well. Little accessories and details can be great for photos. The back ground for this was pretty neat too. We just loved these doors. They were wooden and very rustic. It matched Justin and Melissa's outfits great! We had the newly engaged couple sit on the steps. It's a lot easier to have people sit when they have a smaller dog or puppy. They can come down to the dogs level. In this case, Justin put his arm around the dog to keep him from running off. Which did happen just a few times. It's always good to have a few dog treats as well to get their attention. I think this Boxer just wanted his treats and didn't know why he hadn't got any yet! Location: 6010 Goodrich Rd Clarence Center, NY 14032.